Future Forces Exhibition is a highly recognised international event in defence & security field organised biennially in Prague and officially supported by the Czech Ministry of Defence, Armed Forces, Ministry of the Interior, Ministry of Foreign Affairs, Ministry of Industry and Trade, civil and military parts of the NATO HQ, European Defence Agency (EDA) and many other relevant national as well as international institutions, organisations and agencies. 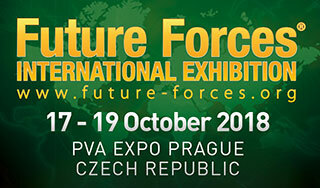 The philosophy behind Future Forces Exhibition continues to remain true to the exhibition’s origins and is in compliance with the principal objectives and actual core tasks of the Alliance and its Partners across the globe, namely the NATO Forces 2020, Connected Forces Initiative, Smart Defence, future potential crises and lessons learned from the latest operations. Buyers, users, military expert groups’ members, scientists, manufacturers, businesspeople and other stakeholders meet to share and learn the latest approaches, develop and deepen international relationships, and gain new business opportunities. Exhibitors and visitors are thus still able to become part of what has always made this Exhibition so unique - the atmosphere of trade, information exchange and the forging of relationships. From congresses, conferences, workshops, seminars, panel discussions and live demonstrations on the today’s needs in defence and security organized in conjunction with the Exhibition within the FUTURE FORCES FORUM, to one-to-one talks with civil and military experts at international levels on the demands of tomorrow, the Exhibition is geared around people being able to meet with each other and develop business.